If you were previously an Authorize.net or Stripe user, make sure you head to the settings page for that old payment integration and disable it now. To finish up the integration, you need to copy access credentials into the settings page in the App Center card and you are ready to go! 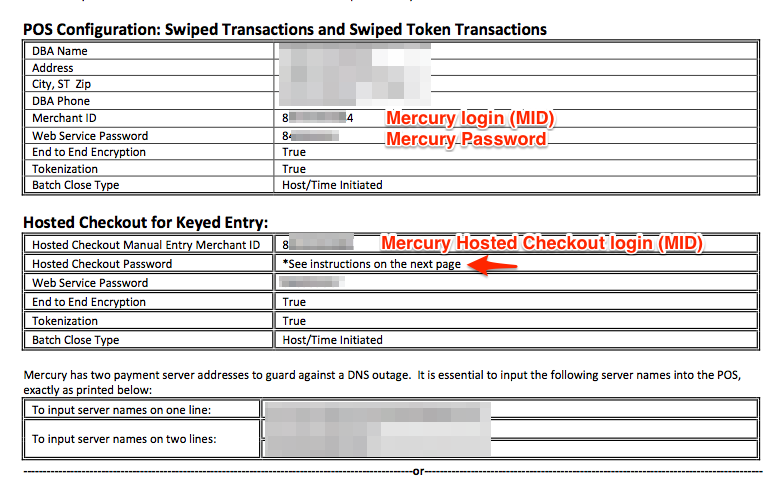 There are 2 sets of credentials you will need, one is the "Web Services"(MID) credential for swiping cards and one for the "Hosted Checkout" (keyed entry, typing in card numbers with a keyboard/etc). * Note: Big Chain Accounts -You have the option of using one set of credentials for all your locations. You will also receive separate credentials for each location, in case you prefer to use that method. 2. Head to your Admin Tab, go to the App Center, click Worldpay. 3. 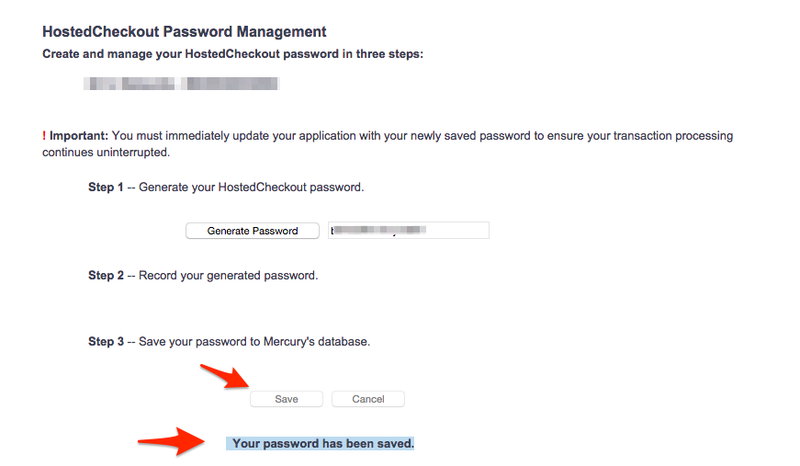 Now head to the portal so you can generate the "Hosted Checkout Password"
Now you can generate the password. It is only displayed here, so be sure to generate it once and copy it so you can paste it into the App card settings page. 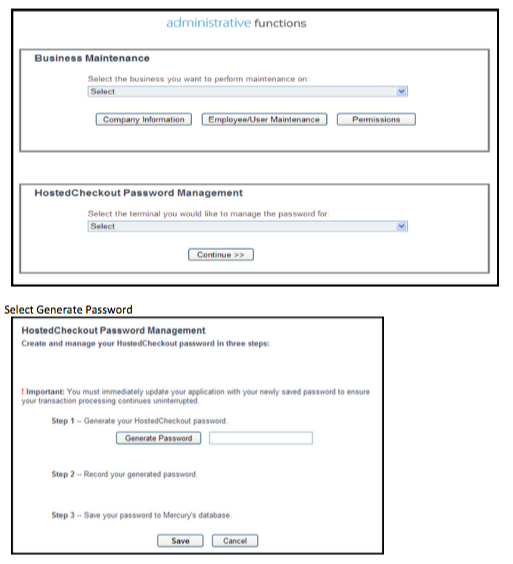 Under HostedCheckout Password Management, select the terminal for which you want to obtain a password and click Continue. Copy this password and paste it into the Hosted Checkout Password field on the App card settings page. *You must click save in the Worldpay Portal or that password does not work. 4. Head to Admin > Payment Methods and make sure that a payment method is set to "Yes" to use for credit card processing. You should now be able to swipe into your new "Worldpay Encrypted" card readers that you purchased, and you should be able to key-enter cards using the blue button on the payment forms. 1. Power on your terminal and connect it to your network via ethernet cable or wifi. Do NOT connect it to your computer via USB. If you are prompted for a password to get on the network, it should be "1234". 3. Give the device a name and enter the serial number that should be on the back of the device. 4. Once that's done, head over to Admin > Cash Registers, and edit the appropriate cash register by selecting the name of the Worldpay EMV Terminal that you just entered. Learn how to use your terminal here! Here we'll outline some common errors we see, and what you can do to resolve them. Error 100 - "Invalid Credentials" or "Authenticate Failed"
If you get this when swiping a card, it means that your login (MID) or password are incorrect. If you are getting this after clicking the blue "Keyed Entry" button, the hosted checkout MID or password are incorrect. Please see the instructions above on how to login to the portal and generate a password. *Make sure that you are using the Web Service Number (MID), not your email address. Error 101 - "We are unable to process your order at this time. Please place your order again." The error that you are receiving "Error 101" is a generic error from Worldpay and typically means that the gateway is busy although it sometimes can mean issues with the card. You can try again in a few minutes, or try contacting Worldpay to see if there is an issue with the card. "Invalid Field - Encrypted Block"
This happens when you type a credit card number into the field that is meant for swiping. If you want to type a card number, make sure to click the blue button first. This happens when there's an issue with the encryption on your credit card reader. When you purchased your card reader, did you buy it from the link on the Supported Hardware page, and did you specify "Worldpay" as the encryption key? "Encrypted Block Invalid" or "Data Invalid"
These errors are usually just a "bad read" of the card. If you try other cards and they work, just run that one as keyed entry. If none of your cards work, the reader could be the wrong type or failing. If you are sure it's the right type of reader with the right encryption key (because it worked for a period of time with Worldpay) - you might need a replacement card reader. Error 203 - "We are unable to process your order at this time. Please contact our customer service." If you receive this, call Worldpay. It means that they need to raise the single transaction limit on your account. Invalid Token Error 200 - This is the result of using a different terminal for a refund other than the one that was used to process the card. Check the location of your invoice and make sure it is lined up with the terminal that processed the customer's card. They need to both be from the same location.